Razer announced its Hydra motion gaming device now support over 250 of the most popular games on Steam, including Left 4 Dead 2, Half-Life 2, and Team Fortress 2. 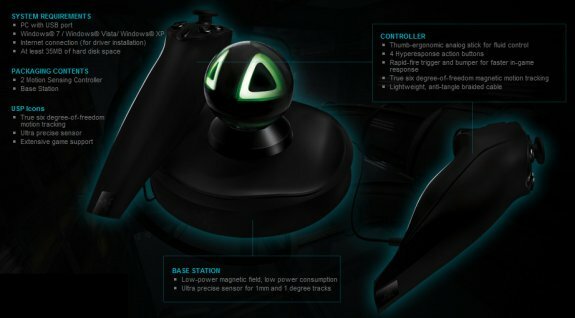 Razer, the world leader in high-performance gaming hardware, together with Sixense Entertainment, the leader in precision motion technology, announce fully integrated motion gaming support for Valve’s game titles including Left 4 Dead 2, Half-Life 2, and Team Fortress 2 using the Razer Hydra motion sensing controller. Future Valve titles Dota 2 and Counter-Strike: Global Offensive will also support full motion play with the Razer Hydra. Additionally, Sixense and Valve have now integrated Sixense MotionCreatorTM 2.0 software with Valve’s Steam gaming platform, enabling backward compatibility for motion gaming with the Razer Hydra for over 250 of the most popular titles on Steam. Now, Steam users will receive automatic motion control updates for current and future game titles, and a new in-game overlay allows gamers to view control maps for the Razer Hydra as they play. “The Razer Hydra’s magnetic motion-sensing technology is the fastest and most precise to deliver a level of gaming immersion other motion-sensing tech in the industry right now can only dream of. Gamers are going to experience Valve’s new and legacy games in an amazing and fun way,” said Robert ‘RazerGuy’ Krakoff, President, Razer USA. The Razer Hydra is the world’s first PC gaming-grade motion-sensing peripheral to use an electromagnetic field to track your hand movements as you hold two ultra-precise motion sensing controllers. Because the Razer Hydra tracks the position of your hands down to a millimeter and degree, saving the world in Half-Life 2, cutting down zombies in Left 4 Dead 2, and pushing the cart in Team Fortress 2 will be a highly intuitive and immersive affair. In response to significant demand from developers, Sixense has created Mac OS and Linux versions of the Sixense SDK (Software Development Kit) for the Razer Hydra. The Mac, Linux and Windows versions are now available for download from Steam. The Sixense SDK allows developers to quickly and easily create immersive gaming experiences that take advantage of the Razer Hydra’s full six degrees of motion freedom. Game developers and independent software vendors who are interested in porting their current games or developing future games based on the Razer Hydra and Sixense motion sensing platform are invited to write to dev@sixense.com. The Razer Hydra is the first gaming-grade motion-sensing controller to bring a whole new dimension of gameplay and immersion to the PC and Mac. With compatibility for over 250 games out of the box and future support for gamers to self-configure controls for any PC or Mac game, the entertainment possibilities are virtually endless. Built to deliver ultra-low latency and location-orientation tracking exact to the millimeter and degree, the precision and speed of the Razer Hydra make it unrivalled amongst its kind.